The Captain America Stealth Shield measures 24 inches in diameter and comes as pictured. Wield the shield of the iconic All American Superhero, Captain America! 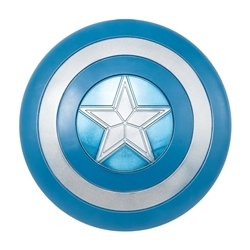 This version of Captain’s Shield comes out on stealth missions, trading the bright Red White and Blue color scheme for a more muted Blue and Silver color scheme. Have your friends equip Thor’s Hammer and Spiderman’s Hood and take on the forces of evil this Halloween!